VonDrehle Corporation manufactures and supplies towel and tissue products for the ‘away-from-home’ market, which includes hotels, res- taurants and a wide variety of commercial establishments. In addition, the company manufactures and buys ready-made paper dispensers, providing customers with the ability to order complete paper dispensing systems. Manufacturing locations and warehouses are located in Memphis, Tennessee, and Maiden, North Carolina (NC). The company also oper- ates a paper mill in Rockingham, NC, and a ‘converting’ facility in Las Vegas, Nevada. VonDrehle fills approximately 2,750 orders each month from a roster of about 400 customers. In 1997, the company initiated a search for ERP software to facilitate growth, achieve green goals, manage costs, co-ordinate manufacturing and warehousing sites, implement digital dashboards and provide in- depth visibility into operations. SYSPRO was selected based on the broad functionality of its Financial and Manufacturing modules. A primary consideration in seeking new software was the ability to co- ordinate all company locations under one IT umbrella. In this manner, updated data on inventory movements, shipping processes and other transactions would be readily available to all system users. By implement- ing a bar coding solution and tying it into the ERP software, the company believed that not only could superior inventory tracking be achieved but also more rapid order turnaround. Towards this latter goal, the company also wanted the ability to pinpoint finished goods inventories at the various company sites. Moreover, by providing the ability for customers to place orders directly into SYSPRO via EDI (Electronic Data Interchange), the company felt it could add to its reputation for superior customer service . SYSPRO Cash Book allows optimal and efficient cash management by providing system-wide bank reconciliation information on cash inflows and out-flows. VonDrehle primarily markets its paper products in the US via a sales force consisting of only 15 people. The company uses recycled waste paper for all its products, earning it a green seal of approval. 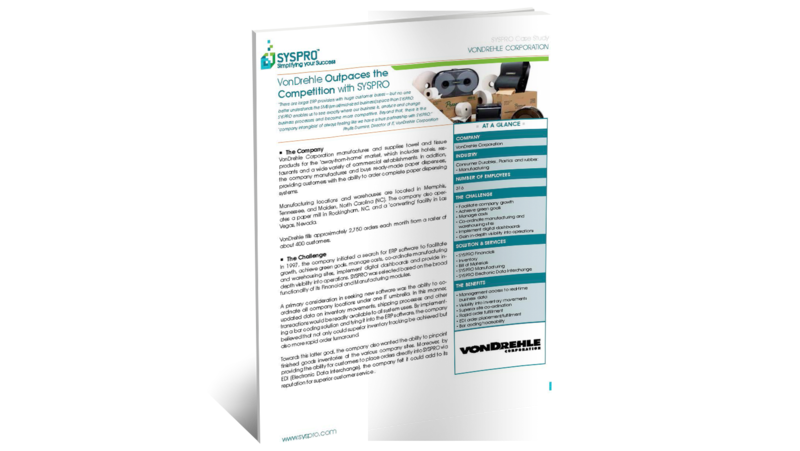 SYSPRO has greatly enhanced the competitive stance of VonDrehle. Be- cause the software enables the company to streamline production and reduce costs, VonDrehle is in the enviable position of being able to under-price its competition. SYSPRO also gives management access to highly infor- mative data. The software produces a variety of reports that give management insight into financials, inventory levels and other operational statistics. In addition, the soft- ware has enhanced worker productivity because each can easily customize the software to access only the specific information required to best perform his/her job.